Sweetflow Mobile's design remains a mystery, but we're going to guess that it's a tad more modern than this tank. Sweetgreen debuts the newest addition, a mobile frozen yogurt truck, to their growing company this Saturday, June 6. 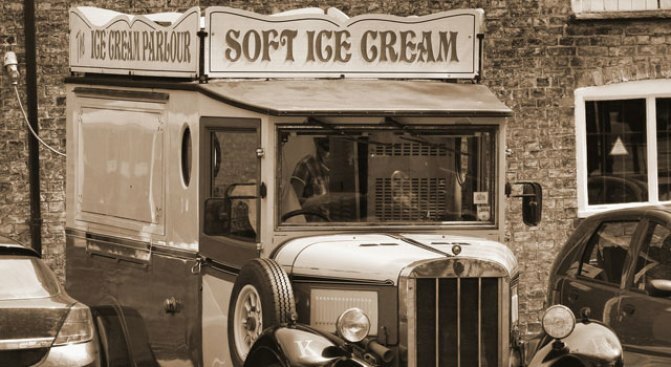 However, this isn't quite the neighborhood ice cream truck you remember from your childhood. Sweetflow Mobile will roam the nightly party circuit, as well as host its own impromptu dance parties in the streets of DC. For those of you who don't rely on Sweetgreen for your recommended daily servings of vegetables and dairy, here's the background story: Sweetgreen is an über-trendy salad and frozen yogurt shop with locations in Georgetown, Dupont Circle and Bethesda. The menu is short and simple, but the food is fresh and flavorful. Sweetflow will dish out their signature froyo with all of your favorite fruit and crunch toppings for about the same price as the in-store product. The only catch is you'll have to find the truck first. But fear not -- thanks to the social networking fad of the minute, you can track Sweetflow Mobile's location on Twitter. To celebrate the truck's unveiling, a Summer Block Party hosted by Brightest Young Things is scheduled for June 6 from 9p.m.-11p.m at 20th and Massachusetts Ave., NW behind Sweetgreen's Dupont Circle location. DJ Gavin Holland will provide the beats, Sweetgreen will serve up the food, and Honest Tea will sate your thirst. We expect lots of excitement, dancing and brain-freeze (natch). Jonathan Neman, a co-founder of Sweetgreen, said that the truck, named Sweetflow Mobile, will meet the rising demand for their catered yogurt and become a modern-day Mr. Frosty. If you go to the party, keep your ears open for their exclusive (and catchy) Mr. Frosty remix song.